The business that formerly housed the Double L in Rehoboth Beach was somewhat of an institution, with MANdance being the go-to destination for dancing into the wee hours on a Saturday night. While the business has changed hands, its best times are just ahead: The renamed Diego’s Hideaway opened on May 18. MANdance officially kicked off on Saturday night. We checked in with new co-owner, Joe Ciarlante-Zuber, who chatted about what’s to come for Diego’s Hideaway, the owners’ history in the town of Rehoboth Beach, and keeping some of the things we love the most. The building that formerly held the Double L has gone through several incarnations in the past few years; what’s different this time, as Diego’s Hideaway? Do you have a long-term history in Rehoboth Beach? 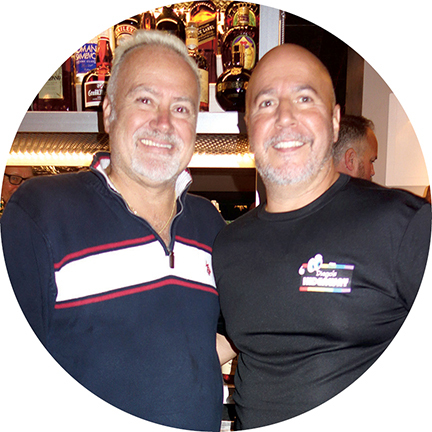 Joe: Darryl and I do have a long-term business history here in Rehoboth Beach, owning several restaurants over the past seventeen years. We were long-term vacationers in Rehoboth Beach since 1989. Then in 2001 we purchased the restaurant Dos Locos and moved here full time. We owned Dos Locos for seventeen years, and recently sold it. In addition, we owned JD’s Cafe in Lewes for a while. What will you be offering that some of the other businesses in town may not offer? Late night Saturdays maybe? Joe: First of all, we have the largest dance floor in Rehoboth Beach. Being outside the City of Rehoboth, we also can do music on our patio. We offer free parking as an added plus. With our patio, we are going to be hosting a Yappy Hour (3-8 p.m.). Our bar is a 21 and over only venue, so no kids permitted. We’ll also be offering an expanded Happy Hour in both the bar and patio. MANdance is a staple for the community; can we still count on hitting the dance floor on Saturday nights? Joe: Absolutely! MANdance will continue as a regular Saturday night event, in addition to occasional extra nights on holidays—Like Memorial Day Sunday. You’re also regularly bringing Josh Schonewolf and his Bearlesque parties to Rehoboth Beach for one of the first times. What made you want to make that move? Joe: Bearlesque is very popular. (Editor’s note: Bearlesque is a body-positive, gender inclusive burlesque group, popular in Philadelphia and other areas.) I definitely wanted something different, as opposed to the usual drag show/karaoke. What can we expect on a regular basis during the week for Diego’s? Joe: We’ll be opening at 3 p.m. daily. Yappy Hour will be from 3-8 p.m. on the patio. Tuesday will be Industry Night, and on Sunday we will have a T-Dance. We’re working on some other events as we speak, so stay tuned to our website for our latest updates! Many LGBT businesses do find it challenging to stay relevant for a myriad of reasons; how do you plan to tackle the sometimes-fickle nature of the clientele who are always looking for the newest thing? Joe: You know, we have always looked to keep our brand fresh with new ideas and insights. We always travel and make it a point to explore new venues. We are typically out and about, and wherever we go we are checking out the local scene for new ideas. The MAL Leather Pageant was always a big event for the Double L; could we possibly see a Mr. Diego’s in the future?